Home » Analog vs. Analogue – What’s the Difference? People all over the world use English, and despite being the lingua franca of much of the modern world, it has many regional variations. Some of the most well-known of these variations stem from differences in spelling conventions between American and British English. Somewhere along the line, American writers decided to simplify the spellings of many words. Some of these words were borrowed from Latin or Greek and carried confusing spelling quirks along with them. The words analog and analogue are a great example. Both of these spellings are considered correct, but depending on where in the world you live, you might be used to reading one or the other. What is the Difference Between Analog and Analogue? In this post, I will compare analogue vs. analog. I will use each of these spellings in at least one example sentence, so you can see them in context. Plus, I will show you a helpful memory tool that will make choosing either analogue or analog a bit easier. What does analog mean? Analog can be an adjective or a noun. As an adjective, analog describes something that can be represented using a continuously variable characteristic. In contrast, something that is digital can only be represented in discrete increments, like 1’s an 0’s. In digital binary, something is either a 1 or a 0; it cannot be anything between or outside that range. It could not be 0.5 or 1.5 or -1. An analog electronic signal can vary, according to many factors. Resistance, for instance, could be measured at 1 ohm or 0 ohms or 0.237634 ohms. Resistance is analog. Many audiophiles consider analog recording and playback equipment sonically superior to digital equipment. An analog joystick offers a finer degree of control compared to a digital joystick, but the digital joystick is more consistent. Analog can also be a noun, where it refers to something which is like something else. Archers were the ancient analog to modern day riflemen. Since they fulfill the same role in the story, The Matrix’s Neo and Star Wars’s Luke Skywalker could be considered archetypical analogs. What does analogue mean? Analogue is the traditional spelling of analog. It still predominates in British English, and is also common in American English in the noun sense of the word. The old analogue circuits were robust, but became obsolete over time. The tragedy of Othello has many modern day analogues. As you can see from the following graphs, which chart analog vs. analogue over the last 200 years, American and British writers have near opposite preferences. These spellings are equivalent. Neither is considered more correct than the other. American writers tend to use analog. British writers tend to use analogue. Since analogue has a U, like United Kingdom, it should be fairly simple to remember that analogue is the preference of most British writers. Is it analog or analogue? 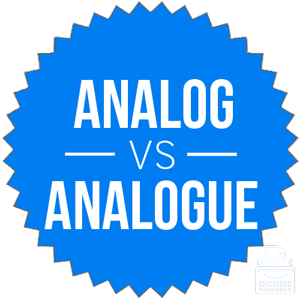 Analog and analogue are spelling variants of a word that means something which is like something else as a noun, and having continuously variable qualities as an adjective. Analog is the American spelling. Analogue is the British spelling. 1 What is the Difference Between Analog and Analogue?